This is copied from your website, very bold claims in my opinion, can you back it up? Do you have enough proof to really say “resulting in the regeneration of new hair follicles in the donor site” ? What is ACell and What are the Benefits? ACell is an extracellular matrix product that speeds healing. ACell attracts and directs stem cells resulting in the regeneration of new hair follicles on the donor site. CIT is a minimal depth technique that leaves follicle stem cells in the donor area; ACell activates these stem cells and aids hair regeneration. ACell treatment also improves the appearance of the donor area following surgery. ACell is an extracellular matrix product made from pig’s bladder. Extracellular matrix exists between the cells of all soft tissue in the human body. When ACell was cleared for sale by the FDA, it was cleared as a “Medical Device”. In other words, its relationship to cells was considered to be like a scaffolding or the studs in home construction that keep the sheetrock or siding in place. It has been later learned that extracellular matrix serves as a cell communication network. This helps to explain ACell’s “remodeling” ability. ACell’s tissue remodeling capabilities are recognized by the FDA and the FDA allows ACell to make that claim. When stem cells are left behind during minimal depth FUE extractions and ACell mixed with hyaluronic acid gel is placed in extraction sites, cell “scaffolding” is restored to a degree as well as cell communication. This allows the body to “remodel” what previously existed in the extraction site rather than filling the tiny wound with the body’s generic filler; scar tissue. ACell is pretty much old news. Dr. Cole is currently using AmnioFix. Although AmnioFix looks far better on paper, we will have to wait to see… Our first patient was treated with AmnioFix about three and a half months ago. The implied/claimed regeneration results using Acell were a little much to be dismissing the procedure now as “old news” in favor of a new method that is untested. Something is off here. Either the results (or consistency) of regeneration with Acell was less than the clinic was leading people to believe or else they were pretty crazy to be abandoning it in favor of a question mark. I think that amniotic membrane has the potential to be much better than Acell because the stem cells are pluripotent. Head to head studies in orthopedic cases seem to point a clear advantage to amniotic membrane. However, we don’t have any data on hair with Amniotic membrane. We do have some cases that we are following using amniotic membrane alone. When we have data on these cases, I will begin to form a decision on the future for regenerative medicine regarding hair follicles. Usually, I try to combine Acell and Amniotic membrane rather than using Amniotic membrane alone at this point. i’m not going to make a change to just Amniotic membrane unless I see a marked improvement in Amniotic membrane. Hopefully, we will have some data soon. Amniotic membrane also has the potential to replace PRP. It’s too early to make any firm decisions yet. It’s exciting. We are always looking for a better option. I think by now we should conclude that PRP isn’t really going to help, it has been floating around for so long now and I haven’t really seen anything that convinces me. The Dr. Cole website makes a startling claim that ACell is regenerating new follicles in the donor site. I’d like to see some real data on that. If the claim is true and not marketing hype, why switch to another product like Amnio? it is not marketing and we didn’t switch anything, we provide Acell treatment because it has been showing success in many patients…we always search the best for our patients and if something doesn’t work Dr. Cole will be the first to drop it as we noticed in the past. AmnioFix is still new, and if it will show greater promise and results then Acell then we will recommend it. in the meantime Acell is the best option. The objective is always to find a better solution. We know that Acell can improve donor healing. In studies where we used Acell, we found the total number of extraction sites that we could locate following a procedure was reduced. There are several reasons that extraction sites might be decreased following application of Acell. One is that Acell helps overall healing of the skin. Another is that Acell helps transected hair follicles grow. Still another is that Acell regenerates hair follicles by stimulating residual stem cells. In a effort to test the benefits of Acell we began to count the extraction sites follow a procedure. On average we found that Acell application resulted in our ability to locate only 51% of the extraction sites. Next we applied Acell to the donor area following a minimal depth extraction procedure. We found that 5 or the 12 extraction sites grew hair. We purposely transected one of these grafts and this one grew multiple hairs. The remaining 4 sites that grew hair had no transected hair follicles. Next we compared two sides of the scalp. On one side we did not apply Acell. On the other side we applied Acell. In the Acell treated side we saw growth in three extraction sites where we did not transect hair follicles. On the untreated side, none of the sites had hair regrowth. So, we know that Acell seems to improve healing and also help hair regrowth. We feel strongly that this is follicle regeneration. However, we are interested in even better results. One problem with Acell may ooze out of the extraction sites. Another problem is that the particles are larger so we may not be getting Acell to all of the extractions sites when we apply Acell in a hyaluronic acid gel. Amniotic membrane particles are smaller. We can deliver them more easily and with a smaller gauge needle. I’m excited about the potential for Amniotic membrane, but thus far I don’t have any data or results. I know I get benefits from Acell. I still don’t know about Amniotic membrane. I’m very hopeful about the potential for Amniotic membrane, however. 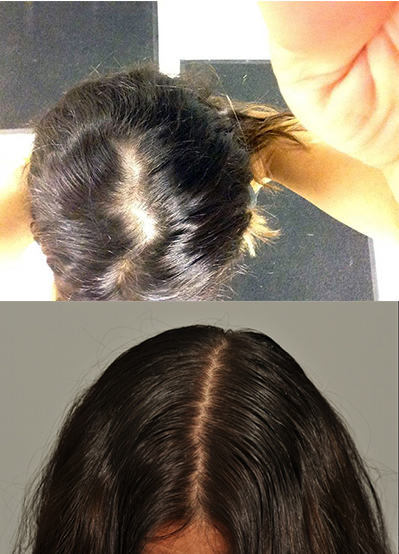 With PRP we know that we can improve hair mass by objectively measuring the cross sectional trichometry. In a followup patient this week, there was an increase in the cross sectional trichometry from 64 to over 90 in one region of her scalp. Cross sectional trichometry is a measure of hair diameter and hair number. I don’t think we are seeing an increase in hair number. I think it is hair diameter. Having said this, PRP is not going to work equally well in all individuals. Many patients also say that PRP speeds up the healing process. I’m also sure there are epigenetic reasons why some medications work better than other medications in some people. There is always much we do not know. Amniotic membrane is a true biologic. We need to give this some time to see if the benefits are equal or better to Acell. Minimal depth extraction is probably very important to the success of Acell. A deeper extraction risks the removal of important stem cells. We know that follicle stem cells are important to the healing process of skin wounds. We know that stem cells from adjacent follicles can migrate, but in my assessment, a deeper extraction results in less follicle growth. Thus, I don’t think the stem cells are coming from adjacent follicles when we see follicle regeneration. I believe the primary source is the extracted follicle. My opinion is that we need Ck15+ stem cells and CD34+ stem cells to regenerate hair follicles. We can obtain these only with a minimal depth extraction. Yesterday Dr. Cole mentioned a hair density study where Dr. Merritt began plucking hairs from a full head of hair. It wasn’t until after 50% of the hairs were plucked that the hair appeared noticeably thinner. We track PRP results using the HairCheck, AKA, a cross-section trichometer. A person’s hair can improve quite a bit without a visible dramatic result. 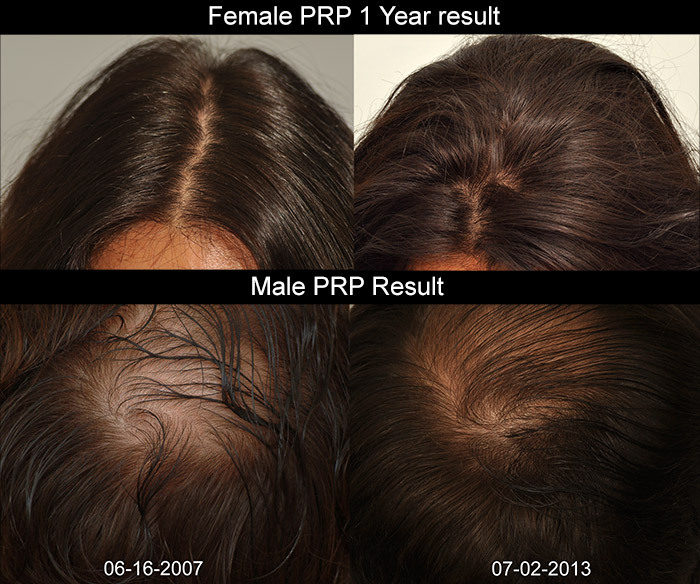 Studies have verified the effectiveness of PRP related to an increase in the hair shaft diameter of miniaturizing hair. “So, we know that Acell seems to improve healing and also help hair regrowth. We feel strongly that this is follicle regeneration.” I’d like to see a peer reviewed paper on this subject by the doctor. In my opinion, that a doctor says something seems to work and that he feels a product works, is not objective scientific evidence, which should exist before selling a medical procedure or product. I have no problem with the assertion that PRP can aid healing. However I question the thickening issue. AFAIK the evidence on PRP points to the thickening results being temporary. Everyone ends up back at baseline within a year. [postedby]Originally Posted by fordham[/postedby]In my opinion, that a doctor says something seems to work and that he feels a product works, is not objective scientific evidence, which should exist before selling a medical procedure or product. Dr. Cole does not manufacture ACell. The company ACell had to prove to the FDA that their extracellular matrix product processed from pig’s bladder enables regeneration, reduces hypopigmentation and remodels tissue. Think of a race car driver. I don’t think they usually manufacture their own car parts and lubricants. Maybe some do. Anyway, they will only use proven products from motor oil to additives, to gaskets, to piston rings, to valves etc. etc. that give them a competitive advantage, increasing the likelihood of winning races. Same goes with a doctor whose desire is to stay competitive using top medical products. Working at Dr. Cole’s office I have seen hairs growing from extraction sites where ACell mixed with hyaluronic acid was placed in the sites after minimal depth FUE. Dr. Cole has done numerous studies in order to verify these observations and the company ACell’s claims. ACell is very expensive. It’s not a money maker because we give too much of it away to repair patients with depleted donors on a budget. No professional I know of is going to spend a lot of money on a product that doesn’t work as advertised. In one study, we tattooed a 1cm square on the right and left side of a patients head. Used ACell on one side and not the other. The side with the ACell did not have visible hypopigmentation and there was some follicle regeneration. The side without the ACell had some hypopigmentation and none of the extracted follicles regrew. Dr. Cooley has verified the regenerative properties of ACell as well as Dr. Mwamba in Belgium. I’m sure there are other doctors who have verified the effectiveness of ACell as well. Mention of hair on the ACell website. Sometimes forum readers hear follicle regeneration and think 100% including an endless supply of donor hair. That is currently not the case. At this point in time, ACell helps preserve donor density and reduces hypopigmentation at the extraction sites. Consider that we have quite a few physician/patients. Every one of them to my knowledge in the last two years has opted to have ACell administered during their hair transplant surgery. Valerie Horsley, a professor at Yale, is investigating how fat cells in the skin of mice send signals to hair follicles and there is some evidence to indicate that fat cells signal an increase in PDGF (Platelet derived growth factors). PRP needs to be repeated and I believe that is because it substitutes for PDGF that would be available naturally in the absence of Male Pattern Baldness. To complicate things further, I believe the body’s immune system plays a role in hair cycles. For instance corticosteroids (immunosuppressants) commonly have the side effect of excessive hair growth. I don’t think they grow hair, but rather inhibit catagen and telogen. Here is a closeup of the male patient’s PRP result posted above. This is the best result I have seen to date. Our patient switched from finasteride to dutasteride about 8 years ago. Well, this “appears” to show some regrowth. But, it’s impossible to evaluate becauase it’s another wet hair vs dry hair comparison. They might both technically be “wet”; but one is soaked and left uncombed in a tangled mess (which always enhances the bald look) and the other is maybe slightly damp and has clearly been combed over. It’s comparing apples and oranges. On the bright side, if you’re a female and suffering alopecia, this appears to work to some degree. I took the photo on the right and his hair was wet. The hair shaft diameter (emerging from the scalp) on the right is noticeably thicker. Our patient agreed to a video related to his PRP result which has been up for a while. The improvement in hair mass index recorded using Cross-section Trichometry is substantial. Please remember that someone with a full head of hair can lose 50% of their hair before it appears thin. The reverse is true, so HairCheck, AKA Cross-section Trichometry is the most accurate way to measure improvement in a patient’s hair mass index.